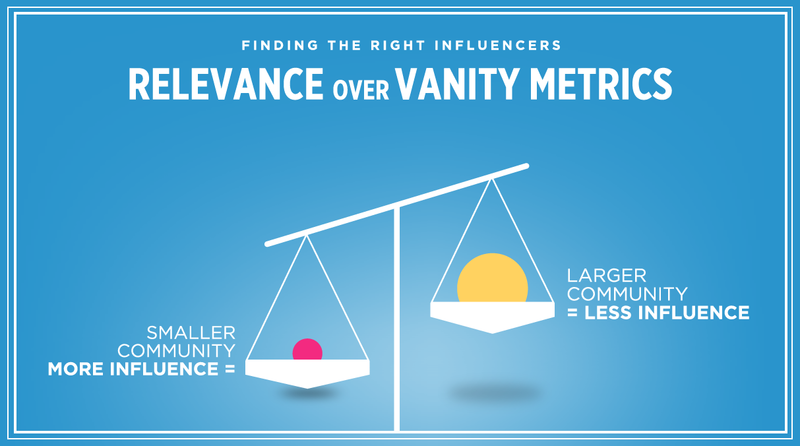 Unfortunately, this rules out too many bloggers because vanity metrics usually don’t match up with the factors that determine success for a brand—like ROI and purchases. What truly does matter is relevance. Bigger doesn’t necessarily mean better. In fact, relevance and niche targeting play a far bigger role when it comes to influence. When you set out on your influencer marketing journey, you’ll want to keep relevance top of mind. It may come as a surprise, but you should be demographic-matching, not vertical matching. For example, you might find a travel blogger educating her followers on a new exercise regimen she’s using to get into shape for her next big trip. 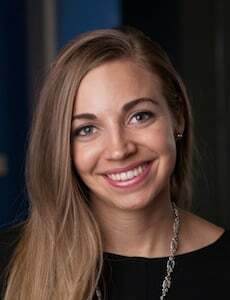 That trip ties back to the general theme of her blog and targets her readers, who are also actively trying to stay fit. To that end, you don’t have to exclusively work with travel bloggers just because you’re a travel brand. Or a fashion blogger might be sharing a home tour, featuring decor from her favorite design company. Her readers are just as interested in styling up their homes as they are their outfits. The same rule applies here: you can work with bloggers outside of the decor space as long as they reach your demographic. 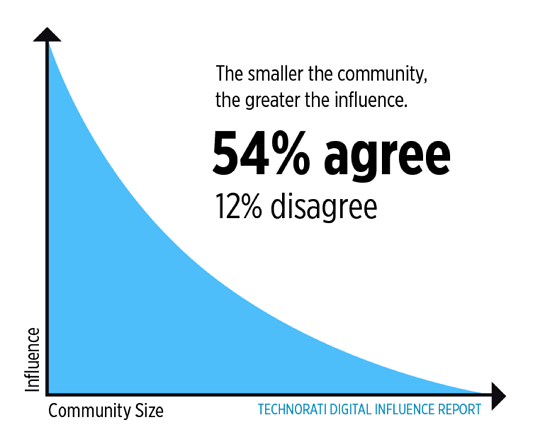 Through the Technorati Digital Influence Report, we’ve also discovered that 54 percent of consumers believe that the smaller the community, the bigger the influence. What’s more, consumers put more trust in these communities. ‘People like me’ consistently falls into the top tier of influencers when it comes to conversions, according to the annual Edelman Trust Barometer research. After all, niche targeting to the right audience is far more powerful than mass reach to the wrong audience! Now, we aren’t suggesting you go after the smallest fish in the sea, but we ARE suggesting that you go for relevance over vanity metrics. Since these bloggers tend to be very niche in their focus, they are also very passionate about their work. They love what they do and because their audience isn’t too large and difficult to manage, they’re able to nurture relationships with them far more than A-list bloggers are able to. They tend to inspire their readers to try new things in their niche based purely on their recommendations. Vanity metrics are all the buzz lately. What with Instagram’s recent push to remove inactive accounts and spam-bots from every account, this topic was brought to the forefront, especially in industries where influencers are heavily using their social followings to secure brand partnerships. And although Instagram cleaned up their fake account act, Facebook and Twitter have yet to join in on the bot-account-removal bandwagon. In fact, some bloggers have even been approved as public figures on Facebook because of the sheer amount of (fake) followers they’ve amassed. What’s more, brands and PR professionals are using these numbers as validation that the bloggers are huge and will produce ‘results’ for them. But what kind of results are they really producing? As First Round Capital’s Josh Kopelman (@joshk) advises, “The real data is retention and repeat usage.” This is what brands and PR agencies should be focused on if they want to see real results. When you’re sussing out the right bloggers for your campaigns—the ones that will produce a good ROI—there are a number of things you should look out for. For starters, instead of just looking at the follower count, dig deeper into engagement. Does the blogger have lots of comments on her social media and blog posts? Are people interested in learning more about the brand or do the comments look more spammy in nature? This is especially relevant if you can find posts where the blogger covers a similar brand to yours. See how the brand is positioned, how the audience responds, and how the blogger interacts back with her audience. Does she nurture them and offer more information? Once you’re digging through her blog posts, try to find patterns in partnerships. Is there any repeat business from brands? If so, it’s usually a good sign that the brand is serious about influencer marketing, and if they’re serious about it, they typically track results. So, the repeat business is a pretty good indication that the blogger is doing a good job for the brand. Lastly, as more brands and PR professionals put the focus on follower counts, we encourage you to look outside of vanity metrics and toward that elusive “magic middle.” When you find these niche and passionate bloggers, you will also find equally passionate audiences that you can access and tap into. Do you have any creative techniques for finding the right bloggers to work with? Let us know in the comments!